Theresa's Mixed Nuts: Shake It Up! 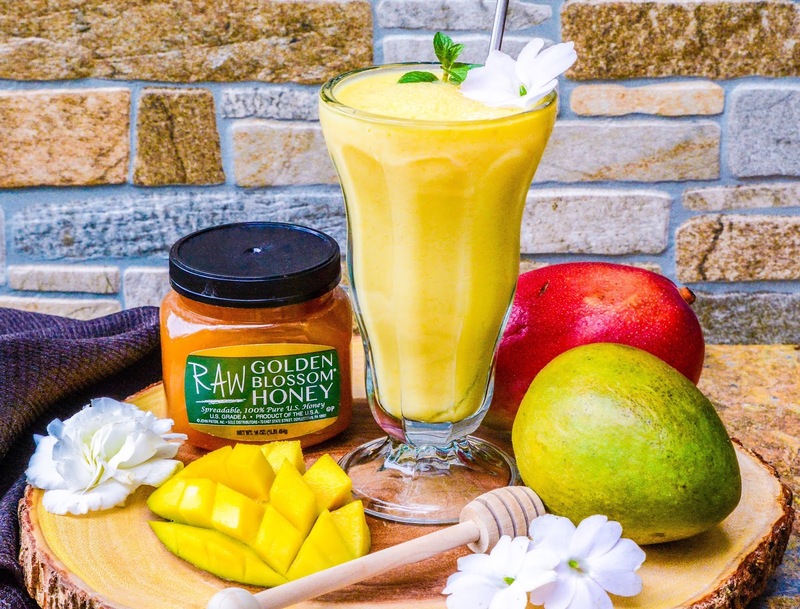 It's Mango Shake Time! Shake It Up! It's Mango Shake Time! I can't say that I was sold the first time I had a mango. I don't know if I just didn't know how to pick a ripe one or if I was just buying them out of season then, but it was definitely not love at first bite. Fast forward a few years, my smoothie bowl obsession had me giving them a second chance and boy am I glad I did. I simply can't get enough of them these days. So, I went a little overboard a few weeks back when our local grocers had them for 33¢ a piece. Talk about a steal when you can hardly find them for less than $1 anywhere else. 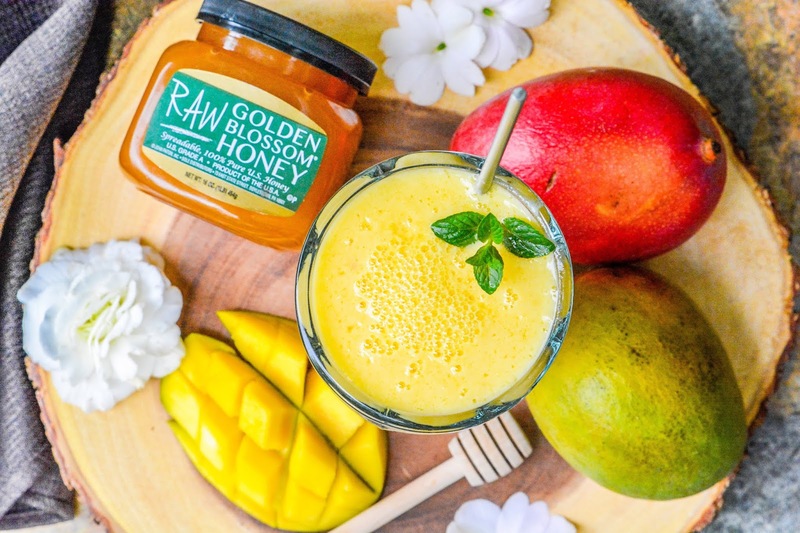 I ended up buying more than I could go through in a week or two, and ended up turning to my trusted recipe source, Golden Blossom Honey, to find something tempting and tasty to help me put a dent in my newly acquired mango stash. Of course, they didn't let me down. I ended up finding my newest addiction, this Mango Shake, that I'll be sucking down all summer long. 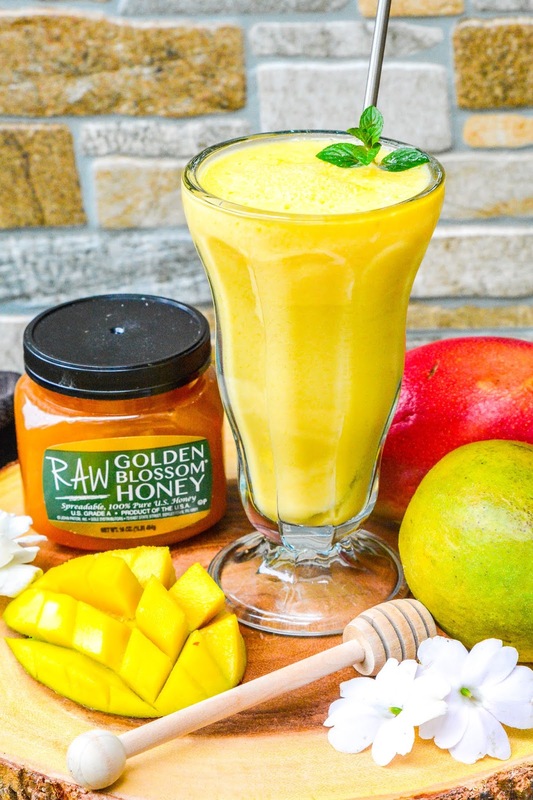 I was hoping to get to a far off tropical location this year, but since that isn't going to happen, I can always whip up a mango shake, have Alexa play some beach waves sounds, close my eyes and pretend I'm on a white sand beach, soaking up the sun while sipping on this tropical flavored delight. This drink doesn't have a thick milkshake consistency, it's more of a fruity drink, but you could always replace the buttermilk with ice cream to give it a thicker consistency if that's what you're in the mood for. Either way, blend one together, pop some pretty flowers or a fruity looking umbrella on the top, and let your imagination carry you away to an exotic fantasy. If you could choose one exotic location to visit, where would you go? Probably Madagascar or some similar very unusual location with flora and fauna unlike anywhere else in the world. Love the glass, is it really big or medium? I have one like that with a long stem below. Our strawberries our in the middle of its season in the backyard, hope the blooms on my raspberry will turn into fruit later this summer. Sounds like it is one that sure sets the exotic mood haha Never a fan of giant litterboxes, so we'll pass on actual exotic locations. That sounds so good! I've never tried making a smoothie with buttermilk before, but I can totally see it working. It's so much thicker and creamier than regular milk. Yes, and not as thick as regular ice cream that can be hard to sip through a straw, so it's a welcome change from the norm. I'm always down for a tropical vacation . 😁 I wasn't sold on mangoes the first time I tried them either, but I like them now. This sounds good, Golden Blossom really does have some great recipes. You and me both. The more tropical the better. And yes, I do love their recipes too! Love mangoes and this looks delicious !! I've been on a mango kick. They are a great cost at the grocery store right now. I cut them up, and put them in the freezer. This is a great recipe to try! I usually pair my mango up with OJ, banana, and ginger liquid stevia.